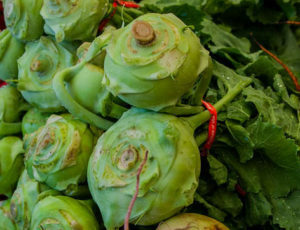 Also called cabbage turnip, the two varieties of kohlrabi, green and purple, should both have medium-sized firm roots. The coloring should be light for the green variety and deep for the purple variety. The greens for both varieties should be crisp and firm. Leaves can be eaten raw in salads or steamed. The bulbs can be cooked like turnips.